LONDON--(BUSINESS WIRE)--Technavio market research analysts forecast the global industrial communication gateways market to grow at a CAGR of more than 8% during the period 2018-2022, according to their latest report. This market research report segments the global industrial communication gateways market by end-user (process industry and discrete industry) and key regions (the Americas, APAC, and EMEA). The emergence of wireless gateways is a key trend, which is expected to impact growth over the forecast period. A wireless gateway links a wireless and wired network and provides integration between wireless communication protocols and the enterprise. Some of the features of a wireless gateway include network address translation (NAT) and dynamic host configuration protocol (DHCP) functionalities. Wireless gateways do not require configuration of the communication path and can manage networks automatically, thus aiding in the quick addition of devices. At present, communication in industries has become more sophisticated owing to the need for high data connectivity. Communication protocols have also progressed with vast changes in network speeds. For instance, industrial Ethernet protocol now can run at a speed of up to 100 Gbps. Also, there has been increased adoption of highly flexible industrial communication cables for use in wireless communication. The use of multiple networking systems by end-users has also compelled cable manufacturers to evolve their cables for wireless communication. EMEA was the leading region for the global industrial communication gateways market in 2017, accounting for a market share of close to 43%, followed by the Americas and APAC. However, the market share of EMEA is expected to witness a small dip while that of APAC and the Americas is expected to increase over the forecast period. 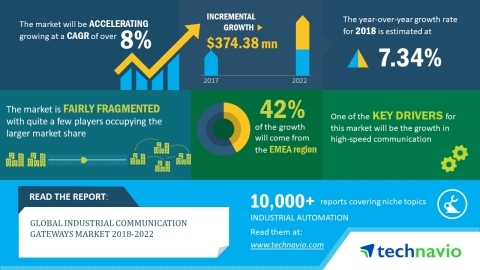 Technavio market research analysts forecast the global industrial communication gateways market to grow at a CAGR of more than 8% during 2018-2022.